Edo “Oh why am I bothering to engage with this thread………..the itch has to be scratched I guess. The 83 – 87 Fitzgerald governments economic performance has to be taken in a variety of contexts for one to come to some kind of an objective conclusion – then again this being P.ie – context and objectivity are a foreign country – subjectivity and the opportunity to quote out of context is the modus operandi for most here, who judging by their contributions were mostly in short trousers or a twinkle in their daddy’s eye at this time and seem to have a major adversion to actually doing a bit of reading and studying anything except newspaper headlines and modern day accepted myth about this era. If one is looking for a significant turning point in the management of Ireland’s financial and economic affairs – I think you have to go back to the 1970 budget where Minister George Colley became the first Irish Minister of Finance to run a current and ongoing budget deficit. Up until this time – since the foundation of the state in 1922 – Ireland had always balanced its books -It was a net creditor – an exporter of capital – in its financial dealings with the rest of the world up to then – unbelievable I know – but a fact – under Blythe,McEntee,O’Kelly,Aitken,McGilligan,Ryan,Swee tman and Lynch – all under the stern conservative secretaries of the Dept of finance like O’Brien,Brennan and McElligott and even the watchful eye of Whittaker – Ireland balanced its books- at whatever cost. All governments from the 1920s to the early 60′s were run on this principle – balanced books, small government and we spent whatever we earned – primarily in agricultural surpluses – in a way – for the first 40 years of our independence- the most important numbers defining our economic well-being was not the annual budget – but the prices for Irish meat and dairy produce on the auction floors of Billingsgate (The wholesale London food markets). Fancy that eh? – A FF Taoiseach and a Dub – even a born northsider and man of the people leading the country into an unsustainable domestic consumer boom built on the balanced books left to him by his predecessors and a minor export boom that quickly fizzled out – yet left with the higher wages and costs and a domestic credit party so drunk that they didnt realise the bus that brought them had left and they would need expensive taxis to get home ?- I mean where have we heard that before eh – I’ve always wondered if Lemass saw this coming and decided to get out while the going was good – funny the parallels with Ahern isn’t it tho? That said – the 60′s “boom” was nothing compared to the late 90′s – and thats why Lemass is revered rather than burnt in effigy as Ahern will be – but it did start a worrying trend of borrowing for consumption rather than serious investment – Lemass was on to the right idea – but he underestimated the Irish people’s capacity for the quick stroke instead of patience,long term investment and delayed gratification and our wonderful capacity for disappearing up our own posteriors and believing that the world owed us a living cos we’re Irish (something 40 years of nation myth building and isolation did nothing to mitigate) – the 60s and the advent of modern communications had opened our eyes to how sh^t poor we actually were in comparison to the rest of Europe – especially in living standards – we wanted some of that – it was a pity we compared ourselves to Germany, the Scandinavian countries and the Benelux – a more accurate comparison would have been our current comrades in the PIGS troope – Portugal,Greece and Spain – also the 1968 revolts gave our union brothers – a cranky narrow-minded workshy bolshie lot even before then – even more succour for industrial disruption in their unquenchable desire for more pay for less work and to hell with the consequences. In short we wanted German living standards on a Greek level of economic sophistication and productivity and anybody who would tell us any differently could go to hell or into opposition in the Dail – the stage was set for the 70s and 80s – auction politics (never far from our hearts since Strongbow set about dividing and ruling after 1169 when you think of it) big time! – the other big thing about the 60′s was the reversal of immigration and the fact that we started to multiply like rabbits again – with consequences for the future. Colley was the first to start the serious borrowing after our economy gave up the ghost of trying to keep up with our desires. In a desire to stop the 70′s being socialist and with a little help from the penultimate constituency gerrymander and the promise of a liberal helping of “whatever you’re having yourself” -FF comfortably won the 1969 election – seeing as we were only borrowing a “little bit” – I think we were talking 0.8% of GDP – sure why don’t we borrow another little bit while we wait for the economy to recover – its only around the corner! – well Lynch, god bless him – finance was never his strong point – even when he was Minister of Finance (then again at least he didn’t cash his paycheque in the Dail bar and keep it in a tin under his bed saving for his kids education when you could have got 10+ % interest in the Banks at the time – knowing f.all about economics or money is no impediment to being minister for finance when you’re in FF obviously) -in fairness he (lynch) with the North going Supernova and negotiating entry into the EEC obviously had other things on his mind – yet the economy did not pick up – exports were flatlining – and the babyboomers of the late 60′s and 70′s started to make their appearances in the demand for social services ( i was born in 72 and there were 38 in my class in a small rural village) – so we kept on borrowing in the hope that EU entry would help correct our finances – Lynch went to the polls in 73 under the reasonable expectation of winning but got pipped at the line by an FG/Lab effort that got it its sh^t together that made the even more attractive promises to gild the lilly of the average voter and get the economy “moving” again and put manners on the slowly climbing inflation and unemployment rate – with EEC membership and increased revenues from agricultural sales looking a given – it seemed a reasonable bet. Yon kippur 1973 came and went and so did the world economy in the same space of time and that was the end of that. The rocketing increase in the price of fuel and disruption that went with it in the aftermath of the war and embargo- allied with the fact that US ways already weary with its Vietnam commitments – pushed the world economy into freefall, surging inflation and massive borrowing to get the economies back into the black – This was the high season for that bastardised version of Keynesianism that appeared in the 60′s – for Ireland and Richie Ryan – the minister for Hardship – it was a very difficult time – 73 to 76 was very difficult with increased industrial unrest, requiring tax increases and a severe struggle to get borrowing under control ,let alone start decreasing it – by 1977 a degree of very very fragile stability was returning – increased and unexpected revenues from CAP were helping prop up what was elsewhere a very very dodgy scene – our export earnings were by nowhere near keeping up with our demands for more disposable incomes to spend on mainly imports and and better and more social services. 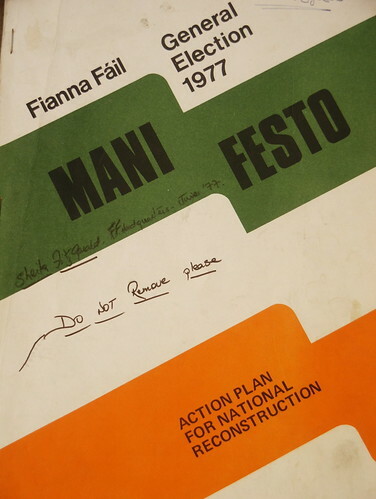 It earned 90 seats and government – Martin O Donoghue – the author of the manifesto was given his own “super” makey-uppey Department , with Colley again in Finance – It became obvious in mid 79 that we were reaching the end of our credit limits and that the borrowing level could not be sustained – the EEC were sounding warnings – then the Arabs threw another spanner in the works by jacking up the price of oil again -starting off another world recession – the unions – particularly , the public sector were after inflation busting payrises (not realising that it was this that was considerably contributing to the inflation spike – or did they care?) – also with our entrance into the ERM – the bonuses from CAP came to an end and prices started to fall due to serious overproduction – a proposal to impose a 2% levy on the farmers came to a quick and decisive end when Colley was forced to back down – with Haughey one of the main populist dissenters . Regardless Colley was gone by 80 – Haughey was in charge – and he knew that we wouldn’t get the same deal off the IMF and international financiers that he had got off AIB – ie 50% of our Public Debt written off – so in midst of all the strikes etc etc -he went and gave his famous broadcast – it was very convincing for a good proportion of the population hearthily sick of the state we had got ourselves in – So with a comfortable majority and fair approval from the electorate – why the F. did he turn around and do exactly the opposite? – caving in to every feckin sponger who turned up at his doorstep? – were the internal tensions within the FF party that bad? was the militant wing of the labour party that much of a threat? – looking at FG manifestos from 81/82 – FG were offering leadership,trust ,Garrett and tough decisions – but very little by the way of financial bribes – why did Haughey have to go on a final financial bender ? – Its a real pity that easily the most gifted,controversial , yet insecure Taoiseach we ever had never wrote an autobiography or published a diary -even for posthumous release – we’ll never know the answer. So thats the prologue for Garrett Fitz’s reign of infamy in the 1980s – public borrowing totally and utterly out of control -forecast for 35% of GDP in 1981 until the election and Bruton managed to get it down to under 30% – rampant inflation -the price of taytos went up on a weekly basis it appeared to me- rising unemployment -the economy crumbling and totally uncompetitive where a direct phonecall from Donegal to Dublin would have to be arranged the day before with the local operator -the population totally sugared out of their heads on unsustainable bribes -a rising population looking for and requiring vastly more than the creaking education and health services could provide – the unions who though they ran the country and coalition with a unruly and divided labour party suffering from militant infestation and constantly looking over its shoulder for fear of being out flanked on the left – Dont forget kids- there really was a Soviet Union back then with real nuclear missiles and most of the left here truely believed that it was the land to be imitated and that capitalism was on its knees after the turbulent 70′s -one more push and it would fall over – over half the membership of the labour party and everybody further left than them believed this – if the 70s didnt go socialist – well then the 80′s were definitely going to. Sure – The Garrett Fitz gov could have done better – with 20/20 hindsight – the non-implimenation of the Telsis report and labour blocking Bolands reform of the public sector come to mind and they boobed big time falling for AIB’s bluff over ICI- but as we say these days – they were where they were. Anybody who thinks that people voted for FF to implement the continued progamme of cutbacks and economies that they did in 1987 -is completely out of their minds and is denying reality – Haughey’s populist opposition during 82 to 87 is a shameful episode in FF’s history. He threw the FF manifesto out the window and let McSharry off the leash – because he had no other choice – The EC,IMF and even Dukes and Fitzgerald in private conversation with Charlie during the interim left him in no doubt that the hard medicine had to be followed – anyway he had become a figure of hate on the left and none of them would support him so he had rule as a minority gov with only the support of FG and the PDs on economic matters only – now, with only his backbenchers to fear – he went and did the right thing. The big question – that shall forever remain unanswered is – what would Haughey have done if he had won an overall majority on the populist ,more borrowing ,more spending manifesto that he ran on in 1987? Its a very good question! then main lesson to be learned from all of this ? – if we have to borrow – we borrow for investment – not consumption – as relevant in 2010 as it was 1960- and that the population have to be educated into where wealth actually comes from – ie not the government or feckin houses. This entry was posted in Uncategorized and tagged Economic policy, economy, Fianna Fail, fine gael, Ireland, irish politics, Northern Ireland, politics. Bookmark the permalink. Thanks Dan. Reading P.ie so I don’t have to! Thanks Dan, for a very enjoyable potted, anecdotal but accurate account of our recent history. So the politics of Ireland from 1970 to 2010 is failure and denial based around borrowing what we are unable to create ourselves, wealth. So, we use other countries money to fund the profligate and “living beyond our means” lifestyles. By 2012 this approach will mean we owe 200bn. People in power realise that by the time you are 70 you are crocked, by the time you are 80 you are usually dead. Therefore their ‘visionary’ policy is to borrow, borrow and borrow and let their children pay the debt down. That’s Irish patriotism. Anyone that participated in the bankrupting of the country should not get any pension from the state. Standby for an invasion of Chinese or Saudi’s who have a few bob in their back pocket because we as a people will not hesitate to sell Ireland as well as our children’s future. Did we not auction off Irish passports to arab sheiks. Let’s start with Mr. Mansfield a developer who wants to open an English language school in Citywest for one of the most militant sects in Islam. For what died the sons of Roisin? Just to note but I didn’t write this, Edo did. I merely posted it so it would find a wider/different audience than might otherwise be the case.